2. If the ping from router to VM machine is not successful then turn off windows 10 firewall. 3. if you want to give the IP address to VM via DHCP configured on gns3 router then make sure you have disable all other DHCP in the network. In case of any issue, you can ask question in comment. 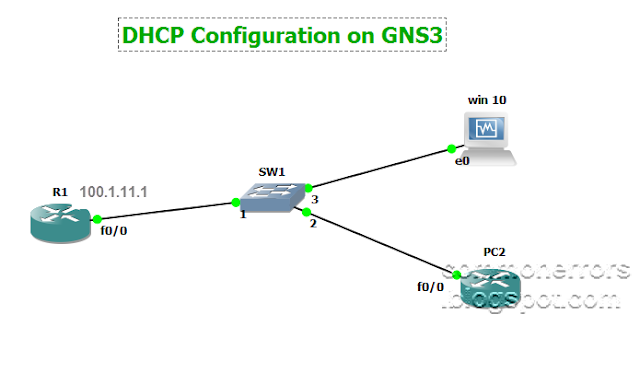 In this article I will show you how to configure and enable DHCP (Dynamic Host Configuration Protocol) on Gns3 router. For this lab I have Create the following lab in which I have configure a router (DHCP Server) as DHCP server where as I used the two DHCP clients which will obtain the IP address automatically from DHCP server. These DHCP clients include a router (which is configured like a PC) and a VM machine. You can visit How to connect windows VM to Gns3 & installation of windows 10 on Virtualbox for more detail. Following configuration are required for making the Router as DHCP server. 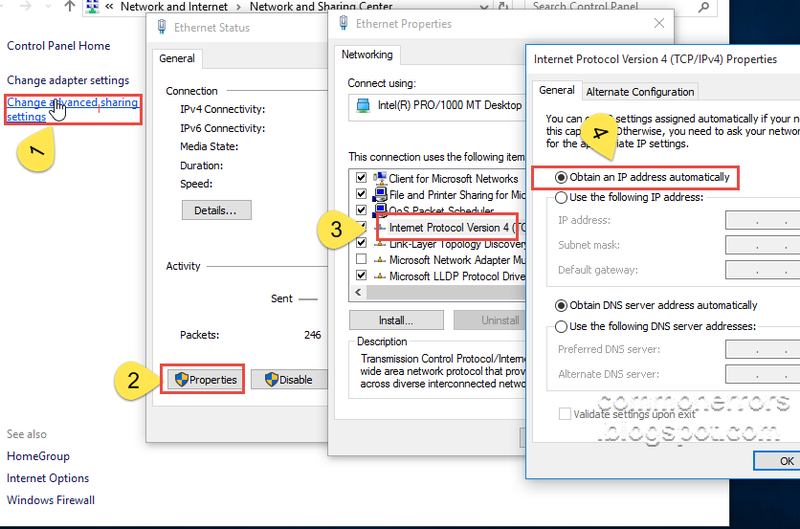 Following are the configuration required on router which will act as DHCP client. Following will be the output in our case. 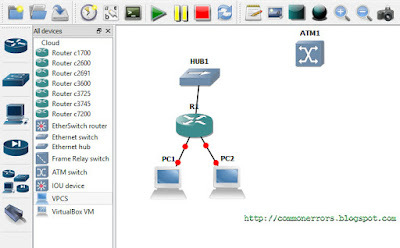 GNS3 is one of the famous software for simulating the network devices. It is important for a networks Engineer or networks profession that he can create and simulate different network scenarios using GNS3. This article is divided into different sections and design for both beginners and advance level GNS3 users. Following are some network labs that you can create with GNS3. Following are some gns3 labs which are useful for CCNA preparation. This article has basic Cisco commands, for more commands and details you can visit Cisco.com. In user EXEC mode you can execute limited array of show commands, basic reachability tests, such as ping and traceroute, as well as other ways of viewing configurations and status info of a Cisco device without the ability to make changes. This command level is represented by symbol “>”, by using command you can “enable” you can go to next mode i.e. privileged EXEC mode. Privileged EXEC mode is represented by symbol “#”. This mode is for users that have been some admin privileges and need to make changes, but in this mode most of commands are related to view/show configurations and debugs. In privileged EXEC Mode most of command show the status of cisco devices, module and startup, running configurations and configurations of different protocols. This mode is for administrator and power user, from this mode you can configure your Cisco device can configure different Protocols. 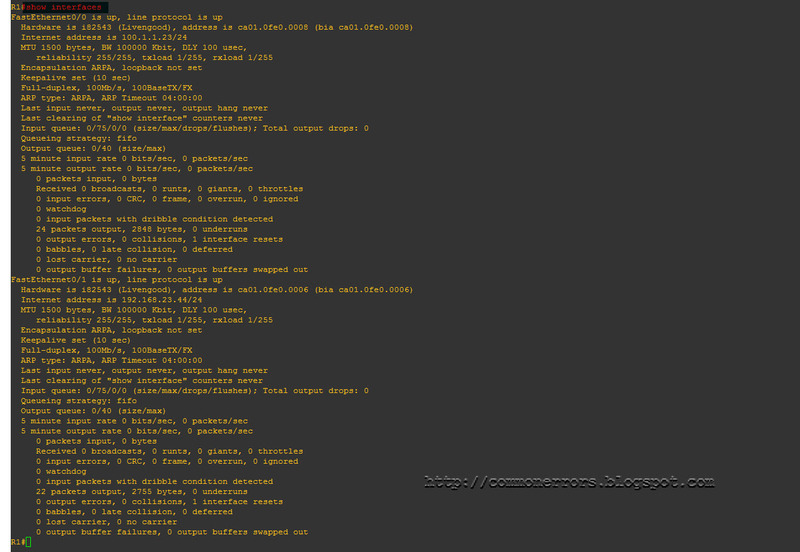 Some of common commands for configurations of this mode are as under. You can access or go to global configuration mode by using command “configure terminal” when you are in Privileged EXEC mode. Note: In this article all Cisco commands are represented with purple color. Show version command will displays the configuration of the system hardware, the IOS version, and the names and sources of configuration files and the boot images. This command also displays information about how the system was last started and how long the router has been running since that start. This command will displays information about the active processes. This command will displays the amount of memory used. 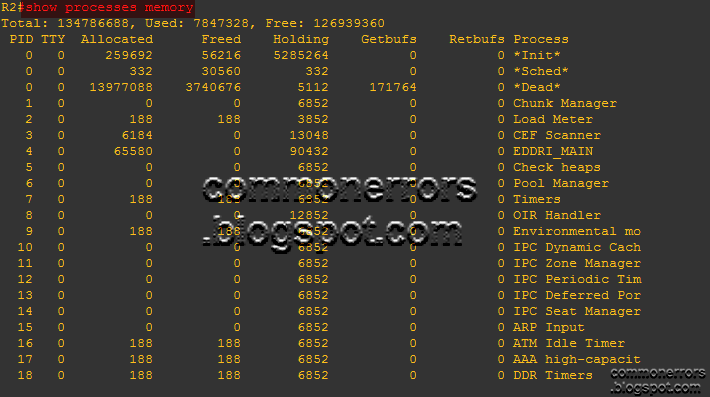 See output of Show processes memory. 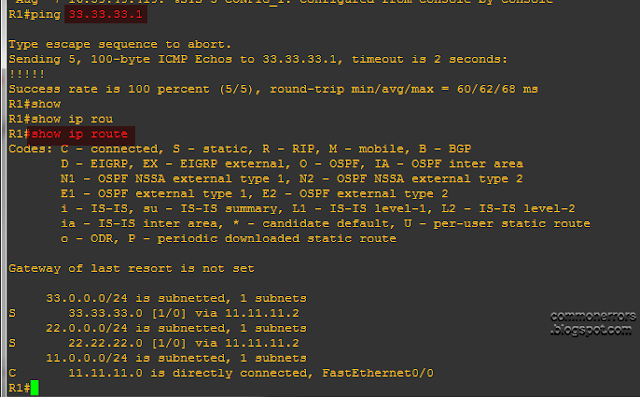 Above command will show all dynamic and static routes on Cisco Device. 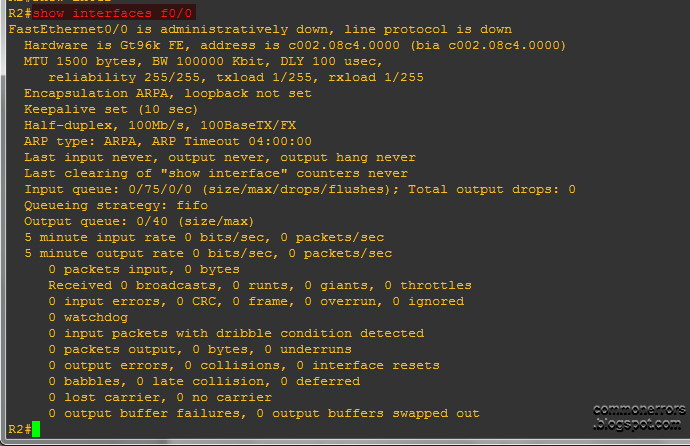 A output of show ip route. Command will show all OSPF routes. Command will show all RIP routes. This command will show all EIGRP routes. This command will show you the IP addresses, interfaces status (up/down), protocol status (up/down), you can view output of Show ip interface Brief from here. 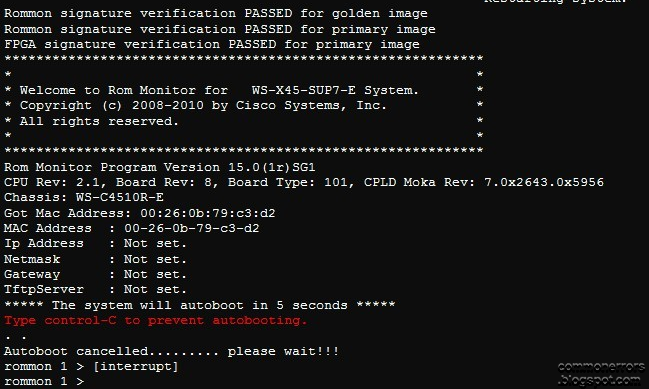 Following are some others show command which are self-explanatory you can try these command on your Cisco device and view their output. To enter in Global configuration mode type: config terminal. Global configuration mode is often used to configure the network Commands. Above command with set the banner to "Unauthorized access to this device is prohibited"
Interface console type the following commands for configuring interface speed. Above commands will configure the speed of 100MBs to interface f0/1. Above command will set a static route for network 210.22.22.0. 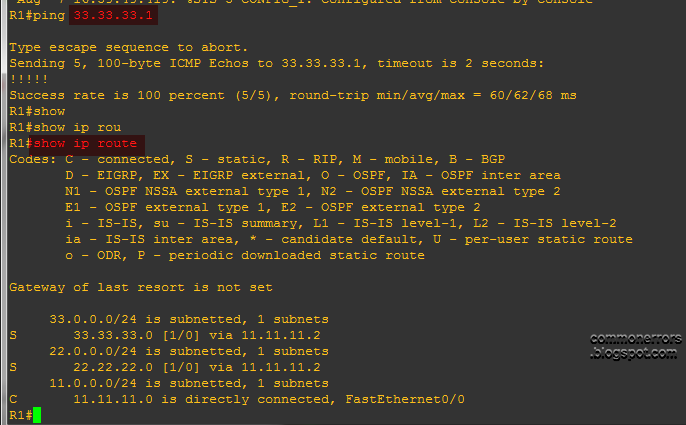 See static routing on gns3. 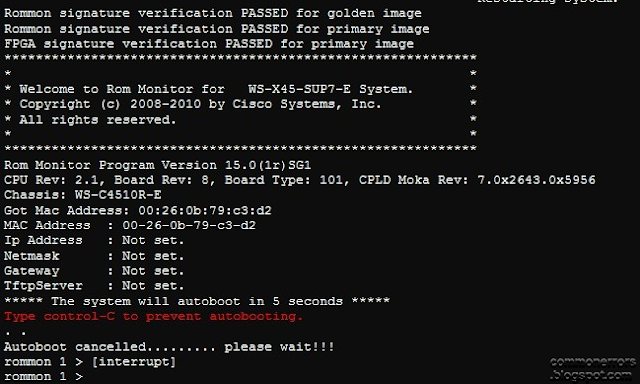 See more for configuration command example of RIP in Cisco from here. Above command will advertise the network 10.0.0.0/24 in area 0. Above command will create vlan 10 with name marketing. Above command will add interface f0/0 to vlan 10. After selecting the interface mode type the following commad. 1. You can use command “Exit” or “end” for exiting the current EXEC mode, but if you want to go back to privileged EXEC Mode from any mode simple hit the “Ctrl+Z” from keyboard. In this article I have combine some of common and basic commands, if you think that there are some basic/important commands are missing here then please comment & I will update it accordingly. Thank you for reading it. Static routing is a core technology that any network engineer must understand. With static Routing you can configure your network without using any dynamic routing protocol like RIP, OSPF etc. Commonly static routes are used for floating routes and a default route. A well designed network should have very few static routes because when you configure a static routes and in case of network changes, you’ll then potentially need to reassess and reconfigure the static route to ensure network connectivity. With static routes, for successful IP communication it is necessarily you configure bi-directional static routes on each router. Consider the following figure, suppose you want to access R3 from R1, in such case you need two static routes one from R1 to R3 and other R3 to R1. Learn more Basic Cisco commands from here. In above Gns3 lab you have three routers on which we will configure routing using static routes. All required configuration are as following, you all also download the full configurations of these routers from links which are given under the configuration of each router. On router R1 one we have one directly connected network (11.11.11.0/24) and two remote networks 22.22.22.0/24 & 33.33.33.0/24. For static routing you need to configure two static routes for remote network and next hope address will interface f0/0 of R2 which have the IP address 11.11.11.2. Next hope address is like a gateway and IP address of neighbor router which is connected to remote network, if you want to access R3 from R1 you will access it through next hope address 11.11.11.2. On router R2 we have two directly connected network 22.22.22.0/24 & 11.11.11.0/24 and remote network 33.33.33.0/24. Therefore you need to configure the only static route for 33.33.33.0/24 with next hope address 22.22.22.2. 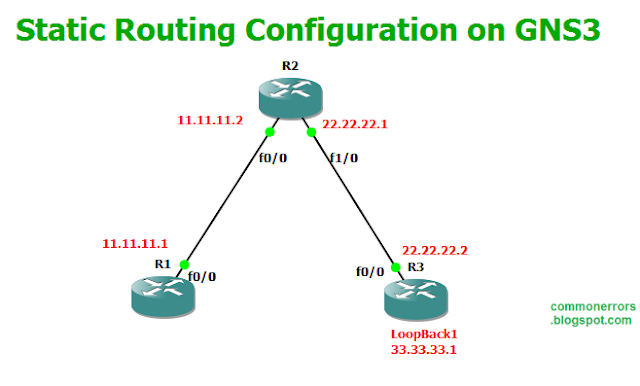 After the successful configuration show ip route on R1 will have the following output. If we forget to enter the privileged mode password, then we'll shut down the router and reboot! Then quickly press [Ctrl + Break] key to interrupt the boot process of the router, it will enter you into rommon mode. This can be done without a password if you are in test system mode. In this mode set the configuration register to 0x2142, which would make the router does not read NVRAM configuration file at boot time. And then restart the router! Exit setup mode! Then we enter the global mode to reset the password privileged mode. You can check the Cisco interfaces with command “show ip interface brief”. The interface and line protocol status output gives information related to the physical status of the interfaces, an example of output is as shown above in figure. When an interface is operating properly, there is only one possible status output. Following are the all possible status of interfaces. This status shows that interface is OK with physically and configured protocol is also working fine. This state indicates a physical interface problem. The interface may be administratively shut down, a situation that could cause both ends to go down. 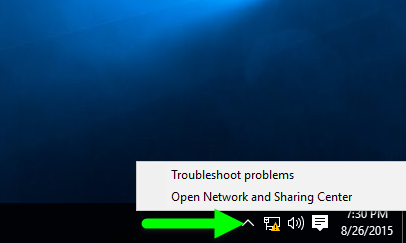 To bring an interface up, use the no shutdown command under the interface configuration mode. This state means that interface is physically up but there is some protocol mismatch, attributed to a clocking or framing problem. To resolve this issue you need to check out your protocol/keepalive configurations. This state indicates interface is shutdown by administrator by using no shutdown command under the interface configuration mode. To bring the interface up, use the no shutdown command under interface configuration mode. This status shows that a loop exists in the network. This problem could be associated with an existing loopback interface. This state often indicates a hardware problem and may be associated with a service provider company problem. GNS3 is software use for simulating different virtual devices and real devices like routers, switches etc. It uses Dynamips which is an emulation software to simulate virtual devices. Gns3 uses real IOS software to simulate the different virtual devices, so you enjoy the new features of IOS with using new IOS in GNS3. Whereas the Packet Tracer is software base simulator which only allows the limited commands which are programed. Some of new commands may not works with Packet Tracer. One of key advantage of GNS3 is that you can connect the simulated device or network to real world/devices. You can review some of example here. GNS3 Cloud, GNS3 Virtualbox. You can take packet capture with Wireshark between devices which you are simulating in GNS3. GNS3 supports devices and IOS of more vendors like Cisco, Juniper, Linux host etc. as compare to Packet Tracer. 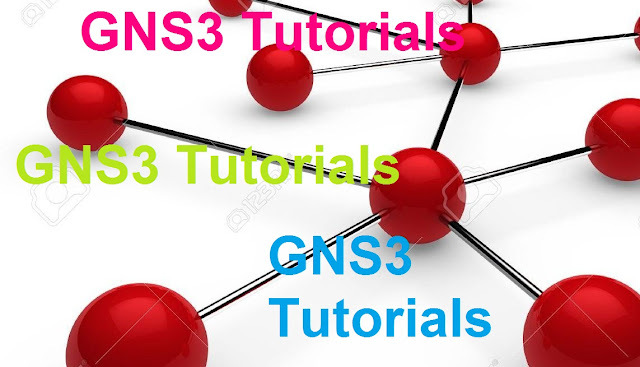 The main advantage of GNS3 lies in hardware emulation, since you can connect GNS3 devices to real world therefore you can ping/telnet GNS3 router from anywhere even from over the internet. 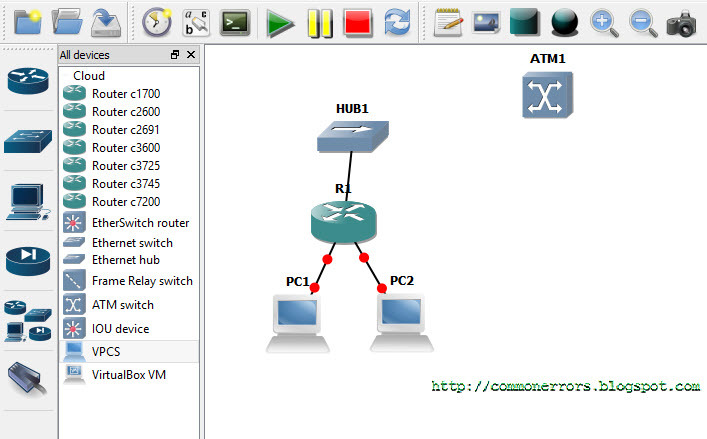 Even you can configure/control the small office network with GNS3 router without using a real router. You can connect and simulate VirtualBox to GNS3 and can create some of complex network labs. You can create your network diagram and can represent your network architecture easily. New versions of GNS3 supports IOU devices as well. You can customize virtual devices by adding different slots and Cards like real network devices.